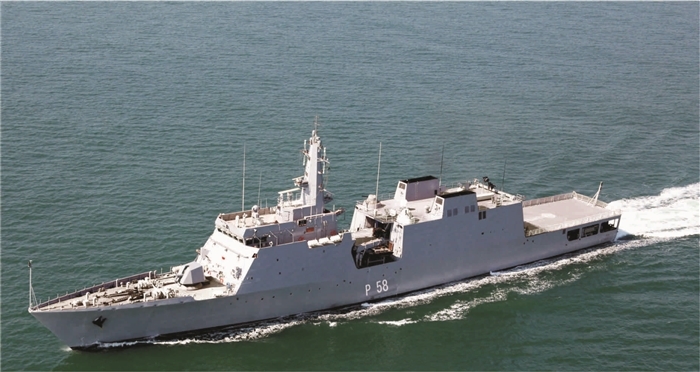 INS Sumedha, the 3rd Saryu Class NOPV made by public sector Goa Shipyard Limited (GSL) will be formally commissioned into the Navy by Vice Admiral Anil Chopra, FO C-IN-C Eastern Naval Command on March 7, 2014 at GSL. The ship will join Eastern Naval Command at Vizag. INS Sumedha was launched on May 21, 2011 and handed over to the Navy on January 14, 2014. INS Saryu, the first ship of the class, was launched on March 30, 2009, handed over to the Indian Navy on December 21, 2012, and officially commissioned into the Navy at Goa on January 21, 2013 by Air Marshal PK Roy, Commander-in-Chief, Andaman and Nicobar Command. INS Sunayna, the second ship, was launched on November 14, 2009, handed over to the IN on September 2, 2013 and commissioned in the service on October 15, 2013. INS Sumedha is 200th ship indigenously built by GSL, which has delivered four classes of OPVs to both Navy and Coast Guard. GSL is undergoing major modernization at an outlay of Rs. 700 Crores, of which Rs. 400 Crores has already been spent. The Yard is near ready to take on construction of new MCMV project, which will provide major push to Naval mine sweeping capabilities.